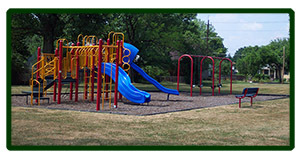 Facilities include a playground, Larry Packer Memorial Soccer Field, and a water fountain. 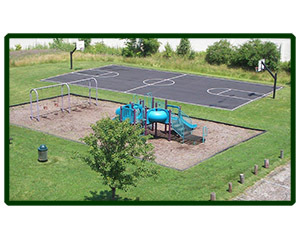 Basketball goal, grills, picnic tables, playground equipment, soccer field, and a water fountain. Basketball goal, soccer field, grill, picnic tables, playground equipment, ball diamond, and a water fountain. Passive setting with no facilities. Ball diamond, soccer field, grills, picnic tables, basketball goal, playground, and a water fountain. Playground, picnic tables, grills, basketball goal and a water fountain.